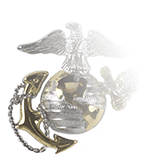 We offer two versions of the nonsubdued, pin-on Specialist insignia. 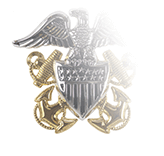 One is an anodized, 22K gold-plated rendering of the unique Specialist insignia that’s worn on the collar of the Army Service Uniform (ASU) shirt, the windbreaker, and the black all-weather coat. 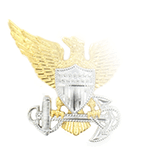 Gold-plated Specialist insignia may also be worn by Culinary and Medical Branch personnel on the culinary garrison smock and medical assistant smock respectively. The subdued version, on the other hand, is authorized for wear on utility uniforms, the cold-weather coat, and the ECWCS (Extended Cold Weather Clothing System) jacket. Please make sure you’re making the appropriate selection from the drop-down box to the right. The Specialist designation was introduced in 1955 with the announcement of a new pay grade structure for the Army’s seven enlisted grades. Specialist 3rd Class was in the E-4 grade, 2nd Class was E-5, 1st E-6, and Master Specialists were E-7—the same grade as Master Sergeant. 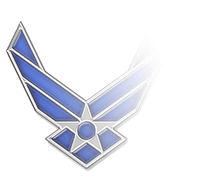 With the overhaul of the enlisted grade system across all services adding the grades of E-8 and E-9, the number of Specialist grades was increased in proportion to the changes, with the result that enlisted personnel not serving as NonCommissioned Officers (NCOs) could now advance from Specialist 4 (E-4) to Specialist 9 (E-9). All these Specialist grades employed the same insignia design of a solid field represent the shape of inverted chevron capped with a hemisphere and a solid field emblazoned with the eagle device. Higher grades were represented by the addition of arcs and, at the highest levels, both arcs and chevrons. Over the years, however, the Army began to reduce the number of Specialist grades and, of course, their insignia. The first change came with the discontinuation of the Specialist 8 and 9 grades in 1965; thirteen years later the grade of Specialist 7 was abolished, and in 1985 Specialist 6 and 5 were also discontinued. 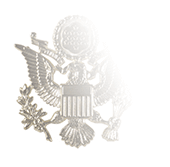 Today, the only Specialist insignia is for the E-4 grade, and its rank insignia is the only one worn by enlisted personnel that does not feature either an arc (“rocker”) or a chevron.